Parts of our area were parceled out to many of the Revolutionary War Soldiers in Bounty Grants to pay them for enlisting and serving in the Continental Army. The colonies had little money left but some had vast amounts of fertile western lands to grant. The table below shows the grants given in acres by rank of soldiers. If you would like to learn more of this early period of our history this site provides a lovely Timeline and more. in order to provide insurance and supplemental income for their livelihood. There are so many who still believe the rest of the world is just like Huntington and there is no sense in leaving. Many believe this area is the least expensive of all to live. It is the hopes of those creating this web site to provide a glimpse of how life could be a couple of hours away. Perhaps this website will enlighten those who feel stranded here without hope or direction. For those who have left and and are now prospering, this may offer a better understanding of the circumstances which made them a refugee from the home of their childhood . (un) employment data. A 1952 view of the old city market in the early downtown of Huntington, WV. Fourth Ave buildings are of Sulivan period. The city market was demolished around 1970 and urban renewal took the rest. Although city officials could manage the destruction of the old town area they couldn't provide the rebuilding. The building of the Barboursville Mall in the early eighties doomed the project. So how did Huntington, West Virginia come into being? Originally Guyandotte located at the east end of what is now Huntington resided on the banks of the Ohio River. One day a railway magnate named Collis P. Huntington stopped there and was angered by a traffic fine he received for tying his horse in front of a tavern such that it blocked the sidewalk. The severe fine angered and filled him with a resolve against Guyandotte. Mr. Huntington used his influence to bring the C&O railroad several miles downriver to Holderby's Landing and as a result Guyandotte stayed an isolated community separated from Huntington by the Guyan River . It would witness the city of Huntington grow to become the largest city in the state of West Virginia and the terminus between the midwest and James River Bay. This is Huntington"s origin. During the time of its growth it became the banking capital of the billion dollar coal fields deep within southern West Virginia. Many mining companies located headquarters here as did the banks, railroad shops , and river boat companies. Factories soon followed and Marshall Academy was founded. Railroads brought goods to the area and coal to the Ohio River as the Big Sandy and Tug Fork Rivers were not navigable for that purpose. Hutington's growth peaked at over 100,000 people by the early 1950's just 80 years after its founding in 1870. C P Huntington died in 1900.
mountain areas. Melungeon descendents are all around us. Elvis may have been of Melungeon descent ! there were "Hopewell" & "Fort Ancient" Indians and in Ohio the last ancient Indians were the "Cole". Most folks know these people as the "Moundbuilders". They built huge earthen mounds in which to bury their dead along with the artifacts of the deceased. The mounds are common in the Ohio and West Virginia area and even into the Mississippi River Valley. MAP. The "Adena" & " Hopewell" peoples were hunter & gatherers while the "Fort Ancient" were cultivators of crops. Little is known of the "Cole Culture" except that they were the last of the ancient indians. Some of these ancient Indians thrived in large communities before Rome, Italy was even a small village. Ironton Lake Vesuvius story, "Adena & Hopewell Culture links"
rich with iron ore, limestone, and timber to create charcoal to fire these huge stone furnaces. Horses and Oxen would be used to pull wagons loaded with iron pigs for shipping to the river port at Ironton. an end to the Portsmouth end of the canal by 1925. The Erie Canal predated the railroads by nearly 25 years. the origins of the city of Huntington, WV. 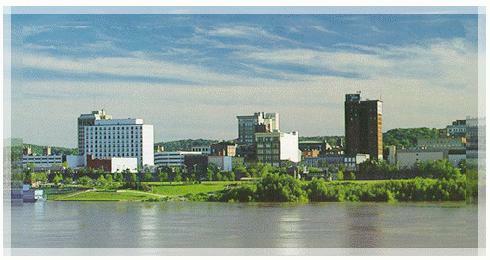 Photo to the left is river front Huntington, "The Jewel City". into the local economy annually. The University is known for it's teachers college east of the Mississippi. person comes from somewhere in the world....and this is my somewhere. slave mother "Liza", carrying her baby as she fled accross the river by jumping from one ice floe to another in the darkness of night while being pursued by bounty hunters. Can you imagine the drama? the end of the Civil War, and it was the only state created as a result of the Civil War. found cover and safety until they could be hidden and instructed on the safe trails north to freedom. As you can see the area has many different meanings for people who pass thru and learn about us. isn't common here. This area developed after the Revolutionary War as land grants were given to the soldiers who fought in the Revolutionary War. The British protected the colonies before the war and did not want settlers traveling west of the Allegheny Mountains as they would have the expense of protecting them from indians. So the colonist were confined for several reasons. The founding fathers did not want it developed before the war either as they felt the British would see a greater prize in the colonies to fight for. This area was once considered for a 14 th colony to be called Westsylvania. Tennessee was also considered and it was to be called Franklin. Those ideas were discarded because some of our early statesmen didn't want to develop the area and scatter a group of fighting men if a war came, and the Colonial Governor of Virginia who was appointed by the King of England did not want his territory reduced in size. He extracted great wealth from the natural resources of this area which led to dissent from those who lived here. It is a trend to this day to extract wealth from this area without reinvesting in it. Our region probably has the greatest abundance of natural resources of the east coast states, and yet is known as the poorest. There is presently an outmigration of people here to the southern states where they find better paying jobs in those economies. WV is the the fifth highest taxed state, and second to the poorest. The Southern part of Ohio and Eastern part of Kentucky seem to be an extension of West Virginia although it is less expensive to live in Ohio and most who have lived in Ky, and WV feel that they are better off financially living in Ohio. Most visitors love the scenic beauty of these areas and are amazed by political leadership and our economic plight. Kentucky. These photos are taken from Virginia Point. with their fiberglass covers stacked. This is the Ohio River Valley area where the three states merge. generating plants which are located along the Ohio River Valley. Small cruise ships which look like "The Love Boat" of television fame, pass thru here to the drydocks for repairs. Many barge tows filled with coal, chemicals, and machinery travel these waters as well. Most of this is just passing by the area. as Mark Twain saw as a kid in Hannibal, Mo. about 3000 horsepower delivered to two prop. Crews include Captain, Steermen, Engineers, Deckhands, & Cooks, who work 30 day shifts. by the Underground RailRoad in those times. blocks. Homes and Barns here were built in this way. could have looked like. Symbols could mark a trail, communicate, and provide reassurance. These three mounds in Ashland, Ky Central Park are part of a group which are said to be worn down to a fraction of their original size. They may have been created over 2000 years earlier. They could have been built by any of these groups of ancient people. Near Portsmouth, Ohio is the town of Peebles. condition for the guest of the park to view. as to whether the mound building indians were the true builders have been ask. to get a good job ?? A few hours away ! So what of the real history of this region? How did this area begin and when? What were the factors that led to the tri state area building up to what it became? Why are we as we are now, when just fifty years ago we were 100,000 strong and being "The Jewel City" meant something? Reviewing our country's history from just after the Revolutionary War until WW11 offers many answers. To some people this story is just a moot point as the region could never return to its former stature in their lifetimes, but it is worth offering some explainations to those who are curious By just moving a few states away, however, anyone living here today can prosper in a manner as their forefathers did a few years ago. Our area outlined in red is "The First American West" and began at the end of the Revolutionary War. You will notice the gold star on the saber is the approximate location of our tristate area on the Ohio River. This was a conduit from the Colony/States to move west into the Louisiana Purchase lands or into the territory of Texas. Revolutionary war soldiers were granted tracts of land in our region and found it abundant with natural resources. We began to populate and develop farms, transportation routes, and frontier industries. After this time the Louisiana Purchase was made and canal building in New York state soon followed this westward expansion. In the forty yeas following the War of 1812 our nation experienced the greatest period of growth in its history and the Ohio Valley was central to it. The topography made the Ohio River the main avenue between the Atlantic coast and the Mississippi valley in that it was the only navigable westward flowing river in eastern North America. Canals were constructed across Ohio, Indiana, and Illinois following those built in New York, and Pennsylvania. In the 1830's Ohio's Erie and Miami canals connected Lake Erie to the Ohio River, making it possible for people to travel from New York City to New Orleans in thirty days. The most important technological innovation of this time were the steamboats of lake Ontario and Erie and the Ohio and Mississippi Rivers. Steamboat commerce on the Ohio River grew rapidly between 1811 to 1830 and the profits soared. 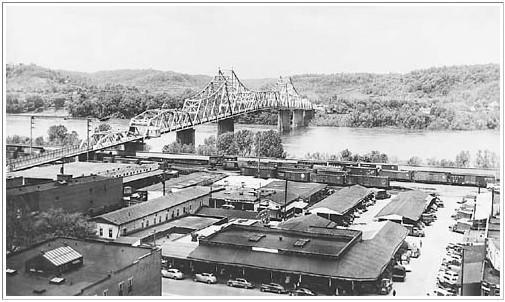 By 1850 railroads were being constructed here and every Ohio River port had a railroad connection such that freight shipped on the river could be transferred to railcars and moved further inland. The early 1800's laid the foundation for the industrial development for the upper Ohio Valley due to the abundance of iron ore, salt, and coal. This region was becoming more accessible to skilled European people who brought their dreams, abilities, sense of industry, and families to live here. The labor pool was provided by the offspring of the pioneer farm families. These frontier hardened workers yielded the manpower for the industries, commerce, and transportation systems which created the strong economy that we realized by the end of WW11. economically. A government backed movement for industry to change from coal to oil fuel took place then. Chemical industries producing a basic chemical called Urea, chose natural gas over coal for their raw material. so much for their ability to govern or lead, but their popularity. Most of their fiscal policies have been failures. the leaders declined it. Charleston, WV the state capital was more than eager to have them located there. yet the decision was made to locate I-64 far south of the town. Further there was little in the way of an express way to link the downtown of Huntington to this new interstate highway so businesses weren't too eager to locate new facilities here. Charleston received the new bridges and road improvements until the late sixties. parking lot. Nearly half of the downtown of Huntington was torn down then and the leaders could not generate the ways and means to rebuild it. In this time an outmigration of people has left the town with half of it's original population base. Those left here must absorb the same tax burden while fearing the loss of their jobs . The companies which provided good wages are almost extinct now, so workers find themselves holding multiple jobs and long hours in order to meet their living expenses. Each spring more people resolve to leave while the weather will allow them to afford the move. Living outside the city is the choice of most middle class. shocked to hear that the first battle of that war occurred in Point Pleasant, West Virginian. Ironically many suggest that "The Battle Of Blue Licks", southwest of Maysville, Kentucky, could have been the last battle of the Revolution in that it was fought ten months after the battle at Yorktown, Virginia which was the last major battle of the Revolutionary War. "On August 19, 1782, Pioneers suffered a bitter defeat and were routed by their Revolutionary War enemies. Captain Caldwell concealed his British and Indian army along the ravines leading from this hilltop to the Licking River. Advancing into this ambush, the Pioneers were outnumbered and forced to flee across the river." indentured servants, or slaves to work their lands. Delaware, Vermont, New Jersey, New Hampshire, and Rhode Island did not have land to grant the soldiers. him. Should you find a good paying job here it's only a matter of time before you are unemployed again. are still living in the tri-state area this information was gathered especially for your benefit. Any relocated viewers wishing to contribute photos from their area (which show wages being paid by businesses there) may contact the addresses below. Heritage Station is the new location of the old Huntington Bank building which was the towns first Bank. It was moved from Third Ave & Fifteenth Street in the mid seventies HS project. Jesse James and his gang are said to have robbed it once when it was in business and escaped into Kentucky. Wouldn't this include Huntington as part of the Old West? expeditions from these locations that we perceive the west as being further away from our Mid Atlantic region. When one thinks of the seaboard states, east of this area, the image of the New England states which are far to the northeast comes to mind. Southern states are clearly defined by the "The War for Southern Independence". It leaves our area isolated without a strong dynamic identity, other than the negative identity created for us by our politicians who dub it "Appalachia" after the eastern mountain range. We just aren't northern, southern, eastern, or western. What then should we call ourselves to reflect a distinct positive image? Holderby's Landing traces to an unscrupulous political leader in Guyandotte. crooks who would use their office to extort his enterprise. Large corporations have examined our area for years and then chosen not to locate here. Could they be seeing in Huntington, what Collis P. saw in Guyandotte over 130 years ago? Anyone who remembers their science classes from school days may recall the discussion of parasites. Mistletoe in trees and fleas on dogs are two examples. area are prized by employers in other states so why not in our region? Maybe it really isn't the fault of the workers who live in this area at all? When these same West Virginians work in other states they are away from our paracitic band of crooked leaders, corrupt unions, and business groups which work to exclude their competition. Most of these same workers succeed and prosper as did Collis P when they relocate. left of what once was here, it is little surprize to see the area's population moving a short distance away to other states and financial prosperity.